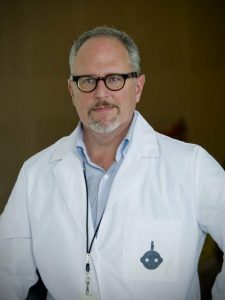 William Joyce has achieved worldwide recognition as an author, illustrator and pioneer in the digital and animation industry. In 2012, he won an Academy Award® for The Fantastic Flying Books of Mr. Morris Lessmore, an animated short film about the curative powers of story. In 2009, he co-founded Moonbot Studios a multimedia storytelling company specializing in books, apps, film and video games. The studio’s projects have won numerous awards and accolades, including an Annie Award, multiple Webby Awards and inclusion in the iTunes App Store Hall of Fame. Since beginning his career as children’s book author/illustrator, Joyce has written or illustrated over 25 books including kid favorites George Shrinks, Dinosaur Bob and His Adventures with the Family Lazardo, A Day With Wilbur Robinson, The Leafmen and the Brave Good Bugs, Rolie Polie Olie and his 13 book series, the Guardians of Childhood. He continues to publish bestselling books through Moonbot’s imprint with Simon and Schuster, including The Fantastic Flying Books of Mr. Morris Lessmore, The Mischievians and The Numberlys. Named by Newsweek magazine as “One of the 100 people to watch in the new millennium”, he has worked on projects with nearly every major film studio including BlueSky, Disney, Dreamworks Animation, Twentieth Century Fox and Pixar. His feature films include Epic, Rise of the Guardians, Robots and Meet the Robinsons. His television series include George Shrinks and Rolie Polie Olie for which he won three Emmy Awards.